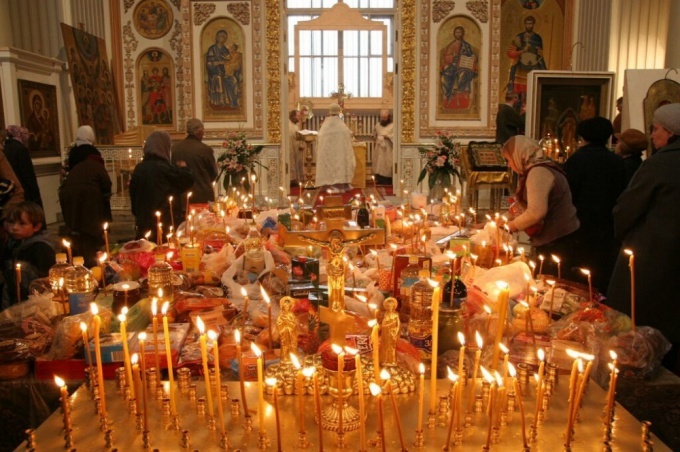 Often in Orthodox churches around the tetrapod (a candlestick for all souls) on the table you can see a variety of foods. This is because believers bring to the Church a variety of dishes to commemorate deceased loved ones. The basic Orthodox principle of respect to the memory of the deceased is the prayer "for the remission of sins and the gift of peace of mind, and a desire for good deeds in memory of those who have completed their earthly journey. The charity expressed in the sacrifices in the temple products, is not just testimony to the memory of the dead, but shows the love of man to the deceased. Usually in packages of food invested in the notes on which they write the names of those whom you want to remember for the dead. This is done in order that the clergy and other Ministers of the parish for a meal and offered funeral prayers in memory of the deceased. It is worth remembering that the Church has developed a practice according to which not all foods can be brought to the temple on certain days of the Church liturgical year. Not supposed to bring to remembrance the meat, as in the Church it is not customary to make in the house of God, the product of the slain animal. Before the alms should be familiar with the Orthodox calendar, to check whether there are at the moment post. If the Church continues a period of abstinence (or falls calendar Wednesday and Friday), the temple do not bring fast food. In these Lenten days are required on a memorial table to put items, blessed by the Holy Church as food at the time of saving abstinence. For example, vegetables, cereals, fish (if not Great or the Dormition fast), seafood. This practice is very logical, because the priests will not eat non-Lenten food on fast days to commemorate the deceased. When the Church calendar provided by the absence of fasting, it is permissible to bring on a memorial table dairy products, eggs, cheeses, etc. (except meat). On the day of rejoicing (the ninth day after Easter) as products to commemorate the most commonly used eggs, Easter and Easter cakes. However, there is not a specific Church decree, so each person in the best of their ability to decide which charity to make. The main thing - pure thoughts, kindness and love for others, accompanied by fervent prayer for them.